I've moved to pastures new a while ago, further into South Lanarkshire. Deepest darkest Lanarkshire, back to the countryside. Or almost so, if it wasn't for the rather large M74 next to the village. 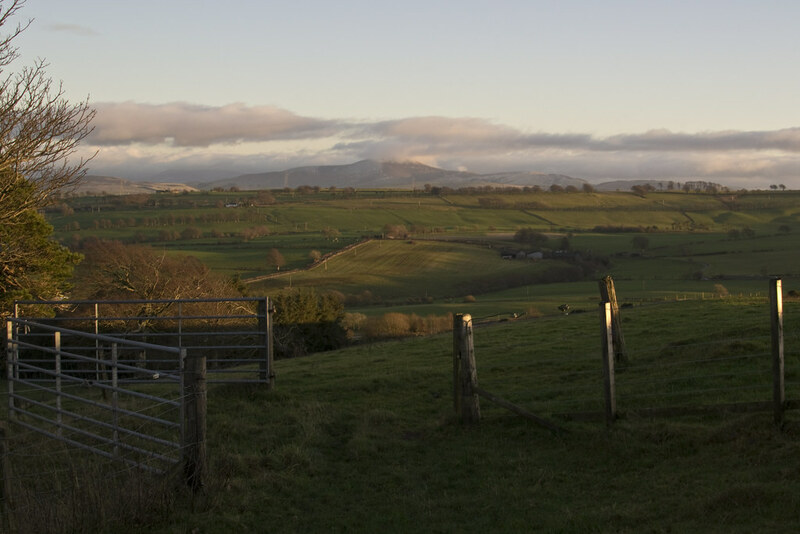 However saying that it's all green fields, hills, woods and little glens nestled down next to the Nethan and a stones throw from the Clyde valley and all that it offers. A happier pig in mud could not be found and to my great delight was some pretty good hills not so far away. Tinto and Culter Fell being a couple of big ones within easy driving distance but also some hills virtually on my doorstep. One of those hills being Blackhill. It dominates the sky line because it's so close. I see it everyday. Not the biggest by any stretch of your imagination. It stands at 951 of your good Scottish feet or 290 metres in the new money. A Scheduled Ancient Monument as well as being owned by the National Trust for Scotland. 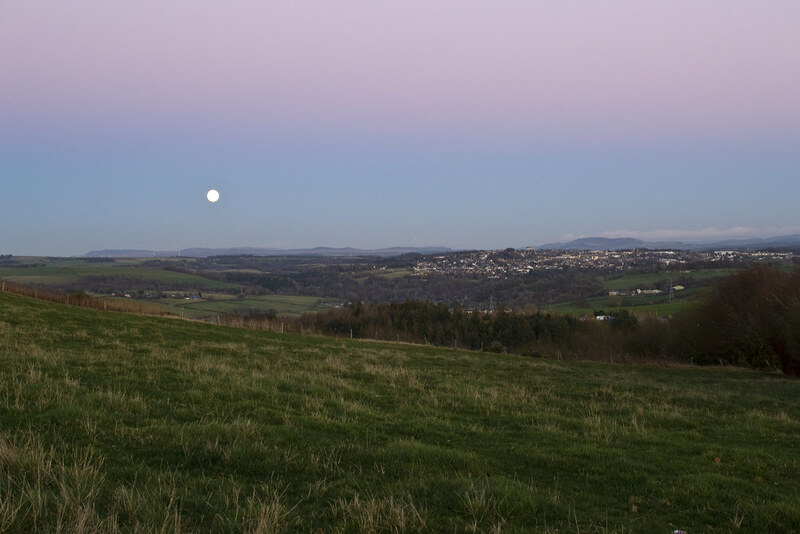 It's not big and it's not pretty but Blackhill is my local hill and at times I have it to myself. What's not to like? That's easy. It's has over 4000 years of history seeping up through the very grass and rocks of it's sides. On the top under the OS trip pillar lies a Bronze age burial cairn. I'm not sure of it's size but it's pretty big. 20 metres across. Next it's has an Iron Age fort and settlement attached with a number of platforms that could have been wooden round house. The fort and adjoining settlement take up the entire hill top. There's ditches and protective walls running round the whole summit. 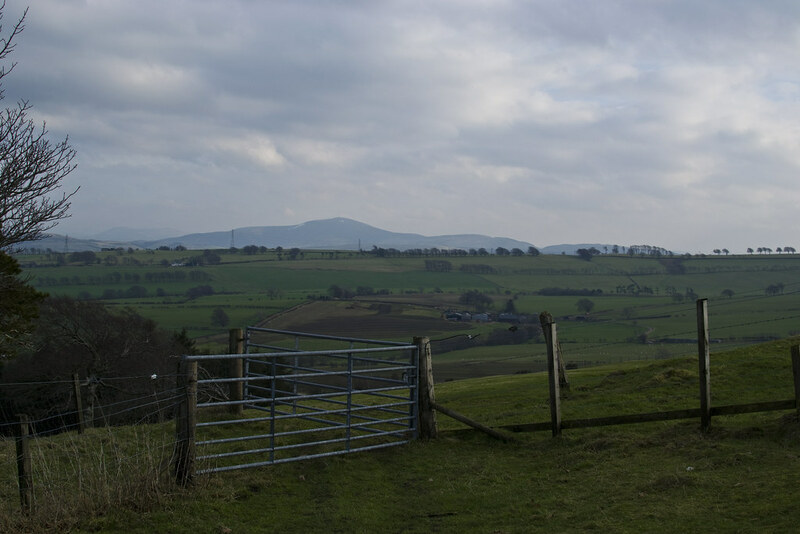 There's possibly a Roman road that runs across the foot of the hill that may have been part of a road that ran from Peebles to Castledykes on the other side of Lanark over to the Irvine valley down to Loudoun Hill. There's archaeological records of standing stones. Apparently at one point it had a couple of standing stones, possibly three. One stone to the south at Clarkston Farm and definitely one but maybe two on the north side at Blackhill Farm. As well as evidence of Medieval occupation and field systems. It's all going on. The National Trust have had it in their possession since 1936 when Messrs Robert Howie and Sons donated it to them and because of all the history it was designated a Scheduled Ancient Monument in 1969. For this particular visit I had a bit of spare time and it was a crackingly clear afternoon and I fancied catching a sunset. I grabbed my camera and jumped in my walking gear. It's only roughly a couple of miles from my house but to maximise my hill time I got in the car and set off for the little layby at the bottom of the hill. Once parked up I promptly marched to the top off the hill which started with a hop over a fence and stile. Then it was just a case of heading upwards following a farm track. There's a big gate to pass through then your in the enclosure from this side you enter the settlement first and it's pretty obvious from the trig pillar where you're heading. Like it's not the biggest or most challenging but once up it pays you back in spadefuls for the little effort you put in. 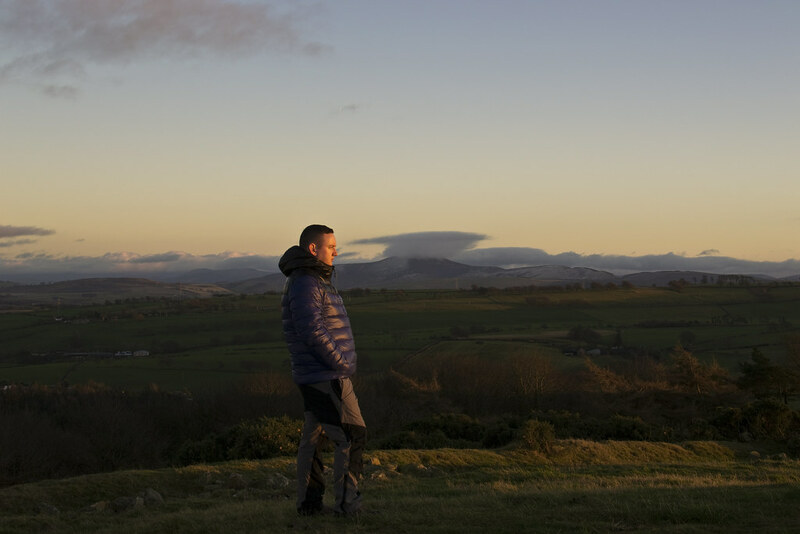 The sunset was still probably a good hour off so I dumped by bag at the pillar and take out my down jacket and hat as it's a bit baltic on top. There's a good breeze going and it is December. What is lovely winter sunshine down by the road isn't warm enough to heat up even at the top of this modest hill. Wrapped up I set of an wonder over the lumps and bumps wondering what it looked like before loads of the stone were robbed and the walls collapsed. Where the standings were. Were they lined up with something. Did they have anything to do with the fort or settlement. Trying to guess the path of the Roman through the much plowed fields. I've got my camera and I'm snapping away. The view's are 360. I still don't really have my bearings when it come to the hills I can see from here. Tinto is the obvious one, due south or there abouts. Apparently the massive cairn there and here are in alignment. It could be something or nothing or just a giant coincidence. With the trig pillar to my back, Lanark in a south easterly direction, I can only think it's the big peaks of Mount Law, Bleak Law, Byrehope Mount and the rest I can see but I'm not sure. Over towards the west and to the south I can see Nutberry Hill, again I think it is. It's all a bit alien to me. Supposedly further over to the west you can see Goatfell on a really clear day. That is one view I would love to catch. By far the best view is to the north and west. It's an amazing view and one my camera skills can't quite do it justice, yet, I hope I will learn to. 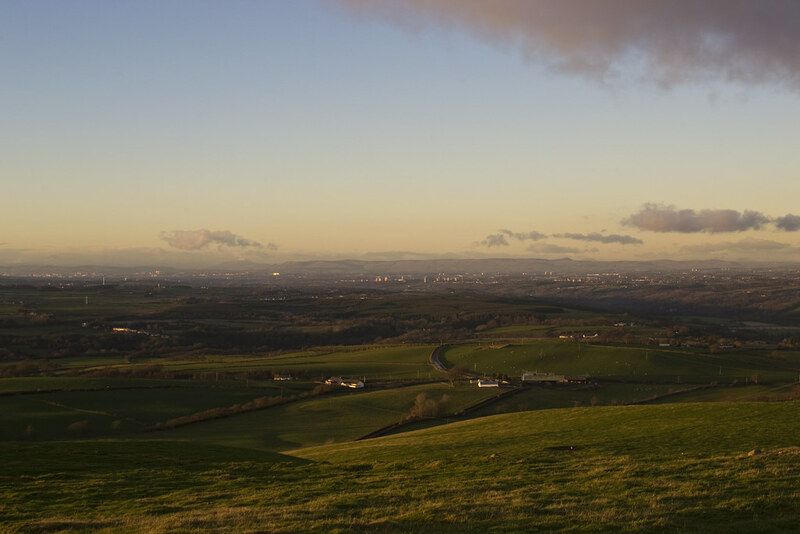 The Clyde valley opens up before you. All the big towns are there. Hamilton, Motherwell and Wishaw. As well as the famous big city of Glasgow. It's beyond them that really takes your breath away. I have in one big swathe, the Arrochar Alps, The Cobbler and Beinn Ime and Narnian. Ben Lomond and it's distinctive table like top, at ease standing proud. Then the full length of the Campsies. However it doesn't stop there, the hills of the Trossachs and all the way to Ben Lawers. I'm pretty sure it's Lawers. There is nothing taller then me in that direction. I have that feeling of being on the top of the world. I'm the only person here and the only one seeing this. I'm in deepest Lanarkshire and I can see all the way to the Southern Highlands. An absolutely stunning view for such a small bump. It's special. I don't think I will tire of this outlook. Yes, there's turbines, towns and city in the road but brain filters those out. Maybe they actually help the view be better, making the hills and the natural stand out against the concrete and the man-made. After my wanderings and musing I start to try and take some selfies. Not so easy with a dSLR or so I find. I'm a proponent of the @DavyWA, @petesy, @MThomson, @Rye1966 school of the outdoor selfie. Maybe they'll run classes in the new year. However they do it so much better but it's a good bit of fun. The sun is on it's final leg to setting. Tinto has a crowning of grey cloud and little jacket of snow on his shoulders. It's catching the sun beautifully and try to catch it the camera. Again I don't do it justice but I'm happy that I'm there to see. Lanark too is looking pretty on the other side of the Clyde. Rooftops, church spires and glinting windows catching the last rays of the sun. Glasgow and the towns to the north are the same. The light is great. It's crisp like the air. I can see mist gathering over towards the Stonehouse and Larkhall. It may over the Avon water. The river and the woods catching it and holding onto it. I'm looking north again and sure it's Ben Lawers catching the sun, way, way, way north. Has to be. I turn west and watch the Nethan gorge turn dark as the sun hits the hills. The street lights of home start to light up and burn orange. By pure luck I turn right instead of left to circle round and look at Lanark again. I catch a sight that drops my jaw. The moon is rising over the hills. I have the top of the moon peeking above one set of hills and the sun disappearing over another set of hills. It's almost perfectly aligned. Where I'm standing I'm the only person that can see this. I don't know if I should take photographs or just watch. In the end I just watch and try to take photographs at the same time. Then it's over. That special moment. The sun has gone and the moon is up. I linger on a bit in disbelief. I've never seen a sunset/moonrise as good as that ever. Even now I can't adequately describe it. The photographs don't either but I was there. 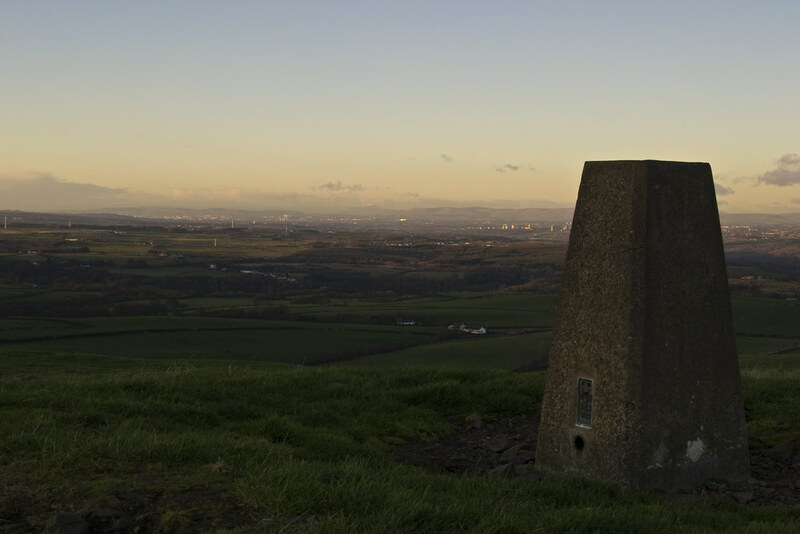 The Blackhill really is a bit special in my opinion and any chance I get I walk up it. It never disappoints. 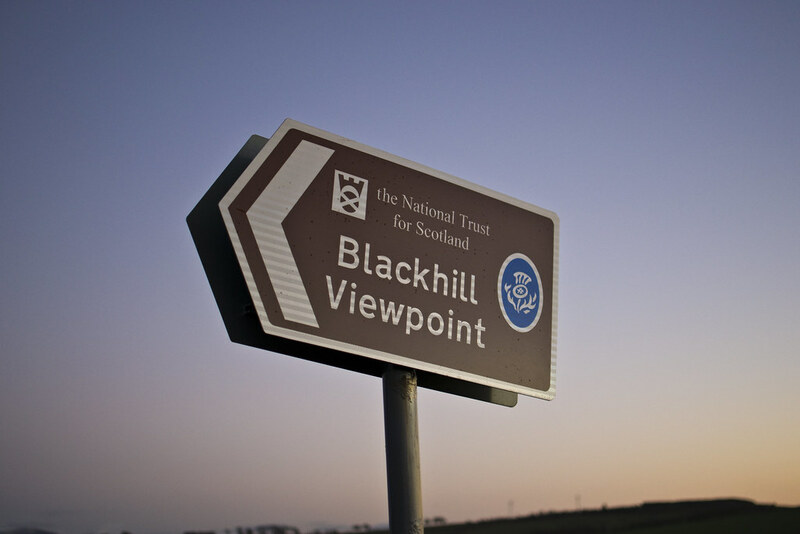 You can find a full set of photographs on flickr, Blackhill.